The Atlanta Gladiators were playing the Norfolk Admirals in an ECHL regular season game, with not much out of the ordinary. Not much, except for one particular person in attendance. Ethan McClean was experiencing his hockey dream. Ethan, 10-years-old From Ballymena, Northern Ireland, is diagnosed with Duchenne Muscular Dystrophy. The genetic disorder causes muscle weakness early on in life, and can eventually lead to weaknesses in the heart and repertory muscles as well. Despite this, Ethan was surrounded by strength on Friday when he got to attend the game. 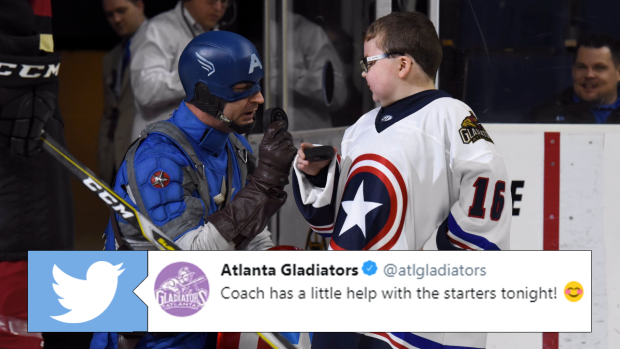 Clad in his custom Captain America jersey, one that the Gladiators had sent to him following their Super Hero night last year, Ethan got to be around the team all day long. This special day for Ethan included attending morning practice, calling out the starting lineups before the game, hanging out with the team, and even dropping the ceremonial first puck. Oh, and he got to meet Captain America as well – we’re sure he liked Ethan’s jersey! Even the Admirals made sure to stop by and say hey to the young Irishman! Sometimes rivalries can take a break for a minute. Special thanks to Chris Treft. Not only was he integral in making this trip happen, he also forwarded on the information so we could relay this special story to you. If you’d like to follow along with Ethan’s journey, the links below are his social followings.